Megan Elvrum: The World's 1st Pop Up Resort at SDCC 2016! 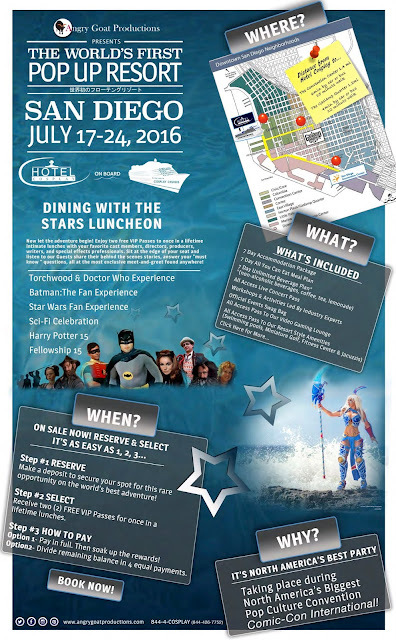 The World's 1st Pop Up Resort at SDCC 2016! Angry Goat Productions, an organization dedicated to engaging, inspiring and entertaining a global community of diehard Pop Culture enthusiasts in unique and meaningful ways, has chartered an entire luxury cruise ship to bring fans, celebrities, corporate brands and live bands to San Diego Comic Con from July 20th to 24th, 2016! Dubbed “the world’s first pop-up resort,” Angry Goat’s Hotel Cosplay on board Cosplay Cruises will sail from LA to Ensenada Mexico and then dock adjacent to the San Diego Convention Center during SDCC 2016. Only 2,500 cruise passes will be available! You can reserve your place NOW with their pre sale. With your deposit, select two free Dining with the Stars luncheons. The company is expecting to sell out passages quickly nerds! Actor from The Hobbit, William Kircher, will be taking an “unexpected journey” of his own joining the Angry Goat Productions team as Director of Entertainment. Additionally, celebrities including Adam West, Burt Ward and Julie Newmar from the original Batman television series will be appearing for one of the event’s six Dining with the Stars luncheon engagements. Fans interested in booking can call (844) 4-COSPLAY (426-7752) or email bookings@AngryGoatProductions.com. For all information pertaining to the World’s First “Pop-Up Resort” and Cosplay Cruise extravaganza, visit www.AngryGoatProductions.com. What do you think of this nerds!? I defiantly am going to look into doing this! What a fun way to kick off the con! Hi ya! Wondering if this event ever took place?? Or does Angry Goats truly have a nasty track record of hosting events? Jan 2017 our group of around 50 purchased tickets to Angry Goats cosplay Sailor Moon / Outlander events - spending $$$$. April 5, found out by coincidence the event had been cancelled (no notification sent to ticket holders). We contacted Angry Goats and filed their refund request form as instructed. It's now Jun 7 and still no refund (only two very squeaky wheels out of 50 have been refunded). Warning my Con going, cosplay and Outlander friends to beware - this company does not seem to be running honestly or ethically. Hey! IDK I didn't get to attend the 2016 SDCC. But that sounds like a horrible experience! I they had contacted me to add this to my blog so I did because it sounded cool. But that's not a great way to run a company! Thank you for sharing! Gearing up for SDCC 2017 ... super excited to have passes again this year!! The Angry Goats experience has me leary about the side events now (they are STILL advertising events on their web page - dirty rascals swindled me and my friends out of over $7,500!!). Pointers on determining if some of the side events are truly legit? ?